Easy-going and hard-working, Davenport is just right. Davenport features classic styling with a sleek leg profile, distinctive bow-front tops and curved handles. Davenport casegoods are designed for a long useful life with laminate cabinets, tops and legs that have durable edges. Bedside tables with rear casters and front glides allow for easy cleaning and room reconfiguration. All Davenport casegoods feature adjustable glides for level installation on uneven floors. 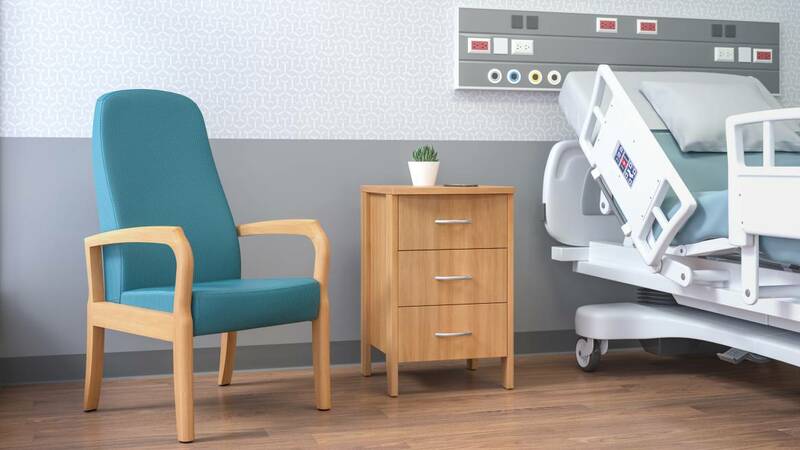 Davenport casegoods boasts smart features that provides easy access and added security for patients, family, and care providers. Easy Access. Davenport doors open a full 175 degrees for easy access to belongings or supplies. Added Security. A bolt-to-wall option modifies the rear side of any cabinet to allow it to be attached to the wall for extra stability. Factory-installed locks are also available.